In this rapidly changing world, the idea of first going to school to learn, to then go to work to work, will change dramatically over the coming years. Lifelong learning is already a concept on many people’s lips, and it’s an area that will develop a lot during the years to come, as more and more people and organizations will realize that it’s not an option to stop learning. Ever. It’s safe to say that it’s time for a learning revolution, and in this post we will look at what learning is, how to create a culture of curiosity as the foundation for organizational learning, and finally how to create above-and-beyond learning plans for every individual as well as for the company as a whole. We as human beings struggle to relate to exponential change, since we think about change as linear. What the Law of accelerating returns that Ray Kurzweil have identified shows however, is that the pace of change is picking up, and that change is in fact exponential. The reason for this is rather straight-forward, which is that the more knowledge and development we have gained, the shorter period of time it will take to gain another equal amount of knowledge and development. 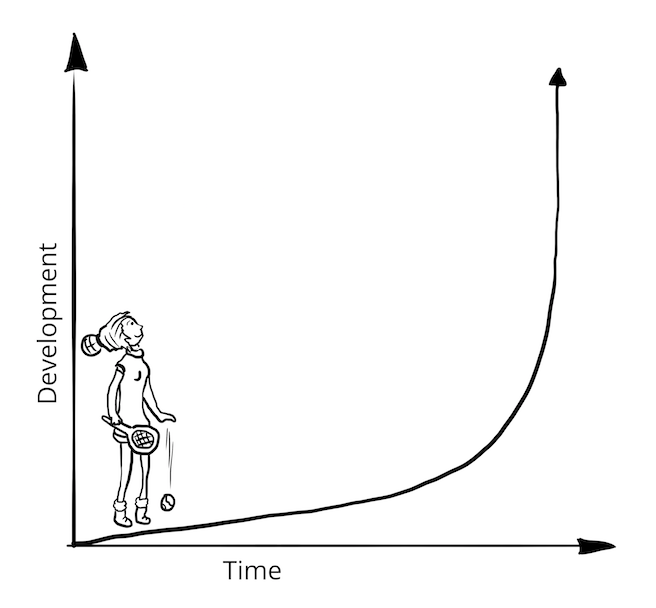 We become better and better in gaining knowledge and driving development the more knowledge and development we have. Exponential development means mathematically that the change we experienced in the past 10,000 years we will experience in the coming 90 years, and the change we experienced in the past 20,000 years we will experience the coming 100 years. This puts us in a situation where it’s impossible to even imagine what the near, and especially distant future will look like. This can be both scary and exciting. If we believe that things change all the time, then learning things faster than competition is the only true long-term sustainable strategy and competitive advantage. Let this one sink in for a bit. One indication of the increasing speed of change is that the average age of the S&P 500 companies have gone from 67 to 15 years since 1920. This means that with amazing learning, knowledge and insights you can build your business faster than ever before. What a great opportunity! One way of sense-checking what learning culture you have as an organization is to ask yourself the question what you are going to learn next week? If you have a learning culture most people in your organization have a good understanding of that. If you don’t know what you and your organization are going to learn next week, it probably means you are leaving learning to chance rather than to design. With learning being the only long-term sustainable competitive advantage that simply won’t cut it any more. The big benefit for people and companies is that learning has never been easier. Never. Any person could check out tons of learning resources online for your specific area, you can identify and connect with thought leaders and communities around the world, you can ask questions and get answers. Any person can try to start a business online and optimize it over time. Khan Academy with their motto You only have to know one thing: You can learn anything! For Free. For everyone. Forever. have delivered more than 580 million lessons to people all around the world. Exchange computer program for human, and you get pretty much the same definition as Merriam Webster suggests. In practical terms, learning and innovation are very interlinked. The overall intent is to understand how to do something better (learning) and create solutions to put it into practice (innovation). 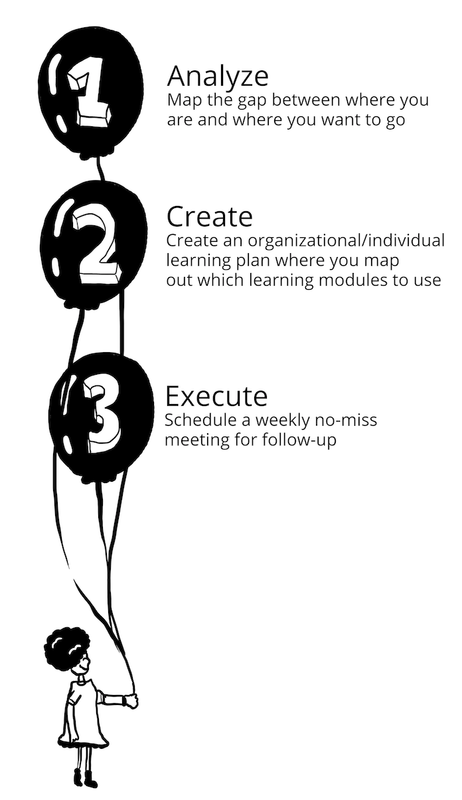 So when creating a learning plan for your company, you could look at it as a learning & innovation plan. Learning, innovation and optimization are all different parts of the same type of ambition, work and culture, which is never-ending development. Think about your company and consider the people there. You can probably give us a list of names of people who are always actively seeking out to learn new things, who are not afraid to ask questions, who seems to have this endless appetite for learning new things. The people who are curious. You can make most people in your company curious by following the advice in this chapter. That said, since people act as people around them you need to go all-in and truly make it the norm. A learning culture will either be for everyone or remain to be the behavior of a handful of people running on their own fuel who are less influenced by peer pressure. Curiosity is a driver of action specifically linked to learning. George Loewenstein, a professor of economics and psychology at Carnegie Mellon University, has been summarizing some of the great findings about curiosity in his paper from 1994 called “The Psychology of Curiosity”. In this paper Professor Loewenstein states that: “when attention becomes focused on a gap in one’s knowledge. Such information gaps produce the feeling of deprivation labeled curiosity. The curious individual is motivated to obtain the missing information to reduce or eliminate the feeling of deprivation.”. So this feeling of deprivation ignites the need to find out more. Already in 1972, psychologist Jerome Kagan pointed to that resolution of uncertainty is one of the strongest determinants of our behavior. This need for closure was coined as cognitive closure by social psychologist Arie Kruglanski, who in 1994 together with Donna Webster introduced a standard way to measure need for closure (NFC). Time pressure – Which is why it’s important to continuously work on the long-term innovation and challenges of your industry instead of waiting until last minute. Look at banks for example, who just woke up to the fact that they have to start caring about customers as their industry gets disrupted. Even though the mobile has been around for a very long time, banks are now under time pressure to get mobile solutions for banking out in the market, which makes many of the solutions half decent at best. They simply want to close the gap, they are not looking to reinvent their industry with their mobile solutions. Fatigue – Which is why physical exercise and rest are so important to make curiosity a positive force instead of a stressful one. Excess environmental noise – This is a tricky one since 90% of the data was produced in the last two years and we live in a world with a rapidly increasing amount of information. The resolution here is about simplifying what is around us, which is why it’s so important for companies to start with the objective and core of every area before rushing into details. One tool we will look at later in this post is the 1-pager, where you summarize an entire area in just one page, making it easy to approach a topic. When we feel that we need to give an opinion – To give an opinion we need to have one, which increases NFC. This is why it’s important to also signal and foster a culture where it’s okay to say “I don’t know”. What can we then do to create a culture of curiosity where everyone is pulled along and positive curiosity spreads like wildfire, enabling the organization to develop faster than competition? Ask questions – A powerful way of raising awareness of a gap in a person’s knowledge is by asking questions. Spend time really formulating interesting questions that points at things and bring in perspectives you didn’t have before in the organization. Also, it’s important that everyone signals that questions are much appreciated, especially questions pointing at old truths in the company or other sensitive topics. Scepticism to truths is a healthy driver of curiosity. Learning and development cannot afford questions that haven’t been asked. Any organization should know which the top-3 questions are for them this year. Infuse with bits of knowledge – We are not curious about things we don’t know anything about. Professor Loewenstein suggests in his paper that to create curiosity we can infuse people continuously with pieces of knowledge. Just imagine how this could be built into a company’s process by for example starting every week by simply sharing a fact or piece of information about an area important to the company with all employees. It could be an article about automation, a TED-talk about programmatic marketing, or a summary of optimization practices. Research in curiosity points to that curiosity increases with knowledge. The more you know the more you want to know. It really creates a positive spiral upwards. Don’t stress – Ensure that we continuously work on the big rocks mid- to long-term instead of only chasing quarterly results. We need to deliver the quarter, but we also need the mid- to long-term expansive learning to be there. Take care of yourself – Eat, sleep and exercise well and enable your employees to do the same. Simplify what is complex – Don’t talk about how big and complex things are. Reinforce the mission of your company and share the core of different areas influencing your organization in a simplified way. Admit when you don’t know – Not only on stage in front of everyone, but in the small conversations as well. It’s very important that everyone in top-management actually do this. We don’t want any CFO or similar to sit there and say (or think) that they know what they need to do and that this whole learning new stuff thing isn’t for them. Everyone in top management have to be in on it. Just imagine how automation and machine learning will transform corporate finance over the coming years. If you do these three things well you will begin to create a true learning culture. Once you start to get that in place you will be helped by another force, peer pressure. Solomon Asch is a known psychologist that had people observe a line on a piece of paper. They were then asked to look at three other lines of similar length and judge which of these three lines that was closest to the line they just observed. The participants succeeded easily. In the next step Solomon brought in people that deliberately guessed on the wrong line. This resulted in that three quarters of the participants got so insecure that they on at least one occasion picked the wrong line. Hence, the majority guessed wrong because of peer pressure. There are more similar studies that shows similar phenomenons, i.e. that our thoughts and actions are severely influenced by what other people around us thinks and do. So if you get enough people to become really curious, want to learn and want for their department to learn and innovate it will have a social impact. Once the majority including management start to behave this way it will become the norm and culture. This is one of the reasons why clusters such as Silicon Valley and the Stockholm startup scene works so well because it almost becomes expected from you to do something great and build a company. One of the most curious companies I’ve come across is the fashion start-up company Ivyrevel. They have truly been able to create a learning culture, and even put a word on it: Pace. They always talk about the pace of learning and how it can remain fast. The owners lead by example by meeting with people they don’t know just to learn new things, but admitting openly when they don’t get things, and by making testing-and-learning an expected part of everyone’s job. They don’t take anything for granted but always looks at things with a no limits mindset. They are curious and plan to do everything they can to stay that way. Pace. Imagine starting up an online store with a group of people. When you start the work you probably think How hard can it be? All you need is to source a couple of products to sell, get logistics in place and a website. When you then start the work you will come across what feels like thousands of things to learn, such as how to deal with different currencies, customs for shipping between different countries, image rights for product pictures and various levels of outsourced logistics. As an entrepreneur, you get a sense of what the major things you need to learn are. Some of it you will learn yourself, and some of it you will recruit for. One thing is for sure though, and that is that you will do a lot of testing-and-learning. As a big company, the clarity of what you need to learn can be more challenging. You might have a well functioning product, healthy margins and in general you might be doing okay. Not everyone in a company of 1,000 people will proactively raise their hand and suggest a list of things to learn as an organization and as an individual. At the same time, the business know-how of people that have worked in a business for some time is often very rich and valuable, you just need to proactively funnel it into a learning plan. Create – Bring together a multifunctional team and workshop what the organizational learning plan could look like in terms of what modules you can use to achieve the learning objectives you have mapped in step 1. Or take your best friend out for dinner to do the same for your individual learning plan. See next section for learning modules you can use for this step. 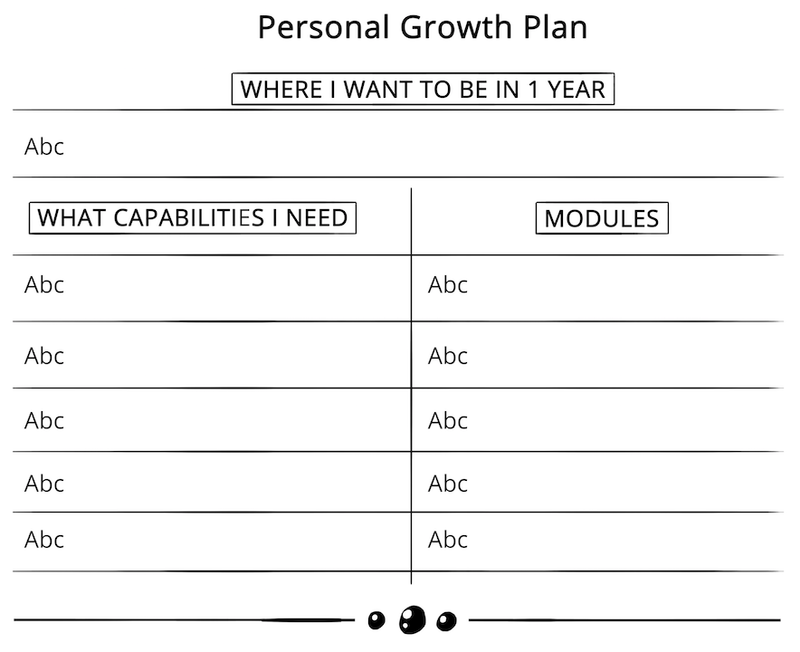 See in Figures A-B examples of corporate and individual learning templates and examples. Execute – Schedule a weekly no-miss meeting for follow-up. Could be as simple as a 15 min meeting with yourself every Sunday evening to think about what you learned last week and ensure that the coming week gives you the opportunity to learn what you need to learn. As for the organizational learning plan a weekly team meeting is a great way to do it. Learning modules are different ways of learning. Experiments are often the default way of innovation for companies while trainings are the default learning way for individuals. This said, there are many more ways of working with learning & innovation, where some of them are listed below. Learn at work – Start, stop, continue. These are the three things I try to be clear about when reviewing what we learned the last week at work. If I would list what I’ve learned, it wouldn’t necessarily have an impact on our future actions, but specifying what to start, stop and continue doing is to-the-point about how the learning will translate into new behaviors. You can do this exercise both as an individual and as an organization. Being conscious about learning is the difference between just working and actually learning by doing. You learn much more at work if you consciously reflect upon your learning instead of just letting learning happen. Start a company – It’s starting to become increasingly common for companies to break away a team from the company to innovate more freely and learn new things, and in many cases with the brief to compete with the rest of the company. Any large company should consider putting together a team of some of the best people in your company with the brief to build products and services that competes with your main business. Being free from the mothership enables people to learn new things and think bigger about innovation than if they would be part of the regular reporting rhythm as everyone else. Who would you rather have compete with you, someone you own or someone you don’t? Write a 1-pager – Any intelligent fool can make things bigger, more complex, and more violent. It takes a touch of genius — and a lot of courage — to move in the opposite direction. is a quote from Einstein, a role-model of mine when it comes to simplification. There is a power in having to summarize and simplify something. You actually need to know the topic really well to be able to do it. Writing a 1-pager is something you can do about anything. What your innovation process is as a marketing department, what marketing analytics is all about, how a very specific part within programmatic works, or which the primary sources for consumer data are. Literally anything. Get started by first just putting down on paper some of the things you believe are most important to include in the 1-pager. Then make it an iterative process where you write, you read in on any knowledge missing, show the 1-pager draft to experts in the area for feedback, update it, learn more and modify further. Once the 1-pager is finalized, share it with everyone that have been helpful in the process of creating it, and with anyone that you think could benefit from it. Observation – You can read articles, watch instruction videos and listen to books. Learn by observing what’s already created and readily available for free. Conversation – You can engage in conversations to learn. One great untapped resources is discussion forums. When we worked with products related to parents with small children a standard routine was to post questions we wanted parents’ input on at parental discussion forums online. Investigate who the biggest ones are for the topic you’re learning and spend some hours reading through them. It’s free. Creation – You can take learning one step further and create things, post them online and get people’s input on it. That is a very efficient way to learn. For example, if you were to summarize 10 truths about the area you’re learning and post them in an expert forum for that area you would learn a lot. Common e-mail alias – An e-mail alias where you can share data that you come across, throw out questions for quick replies and in general share & re-apply on the go. Regular video chats – Have a monthly meeting where everyone calls into a video conference and you look at a specific study or debate a specific point. Meet – If practically possible, meet up. Get a mentor – Mentorship is talking to someone on a regular basis that has experience, knowledge or character traits that you want to develop in yourself. All people have something to learn from each other, so in most cases a mentorship is a two-way mentorship whether it’s explicitly called out or not, i.e. the mentor also learns from being a mentor. Mentorships can be meeting for a lunch every second month, jumping on a video call every month, meeting for a longer dinner one time per quarter, doing a 15 min call when needed. The form in itself is not the important thing, so chose something that fits both of you. You should set the bar very high when it comes to who to have as a mentor in a specific area. Let’s say for example that you want to learn about marketing analytics. You can conduct a study by asking 10 people that work in the area of marketing analytics to each mention three people they consider the best people in the area of analytics. Then contact the names that comes up and ask them to mention the three best people. Continue for as long as you find it useful. What might happen is that a couple of names comes up more often than others. These could be the people you approach about mentorship. Don’t hesitate even if the names are famous, top executives or otherwise. The biggest difference between who gets a great mentor and not is who dares to ask for it. Play customer – If you don’t regularly put yourself in the shoes of your customers you won’t know what it’s like. If you have worked in an industry or at a company for some time it’s easy to get complacent and think you know what it’s like to be a customer. That is not a learner’s mindset. What you can do is introduce The Monday routine for everyone at your company, including the top executives. Every Monday morning at 9am, people have to spend 30 min experiencing your company as your customers. It could be by trying to get in contact with customer service about something, browsing the web with your phone pretending that you’re new to the industry, entering a competitor’s website or applying for a job at your company. This exercise is as transformative as it is easy. The big difference is between companies that are able to make this a habit and companies that don’t. Get it in your and everyone else’s calendar. Work someplace else – Every quarter I go and work for free for three days at another company. Which company depends on my learning plan. Contacting a company in this matter might feel awkward at first, but in most occasions people are just happy that you reach out. Teach someone – There is a person in my organization that always signs up as an instructor in whatever topic he is about to learn. Signing up created the right sense-of-urgency to schedule meetings with the best people out there on the topic and dive into the latest reports online. If you sign up to teach people something then you get motivated to learn it yourself. So, if you want to learn more about an area, sign up to teach it to a group of other people four weeks from now. Plan a succession – The mentality of leaving can stimulate you to fill knowledge gaps and rapidly develop yourself and your organization. If you were to sell your company, what would you want to put in place before it got sold? If you were to leave and hand over to someone else, what would you want to learn to make a better handover? Planning a succession or sale, even if it’s not real, can give a new perspective on what you need to learn. Start a blog – Someone said that there are already enough blogs on the web. Not sure that’s right, but the point of starting a blog for learning purposes isn’t necessarily to have lots of people reading it. The point is that if you would have to write something every week of high quality you need to always learn, gather your thoughts and tie up any potential loose ends in your knowledge. It’s really a challenge and rewarding experience. A blog is definitely something you can have as a department as well, it doesn’t have to be an individual only. Have a monthly lunch – Who are you? is sometimes the reaction I get when calling someone that seems interesting and asking if we should have a lunch. After properly introducing myself and the concept of having monthly lunches with people the reaction is surprisingly positive. I’ve had lunches with many different people, from a Professor at Karolinska University Hospital (who hands out the Nobel prize in medicine) to an ex drug addict to understand how the dynamics in the less fortunate parts of society works for real. Schedule a lunch every month with someone you don’t know in your industry. If you work in a big company, you can also apply this principle to expand your understanding of your own company. Place a daily call – When I started doing this I called someone in the industry to work and from work every single day to just have a chat and ask what’s new. The first days went quite easy since you have a handful of people that are very easy to call. That said, after some time the size of your personal network gets tested. After a couple of weeks calling someone to and from work every day you need to think harder and harder about who to call next, and then you start thinking broader about who you would want to have that type of relationship with so you can just call them. Not only will this exercise build your capability, but it will also broaden and deepen your personal network. And in a time of many many emails, how nice to get an unscheduled call from a nice person just checking in. Acquire/partner with companies – You can learn a lot from working with partners that complements you. Acquiring a company to get access to knowledge is quite common, but thinking broader about which companies you could partner with is not as common. There are often industries on the same path as your industry, and perhaps you could partner with a company in a completely different, non-competitive industry that faces some of the same challenges as you do? Do a weekly reading – I used to work with a PR agency where every single employee spent 90 minutes every morning just reading the news. Their job is to be on top of what’s going on, but having a regular pace and clear reading list is something you can apply as a marketer as well. List the biggest information sources for the areas you want to grow in and read through them every week. If you do it as an organization you can also bring up any insights in your regular business meetings and discuss how to act on them. Share what you do – When you think you get something, summarize it and share it with the thought leaders in the field. Let’s just say that after that you know if you did get it or not. There is no room for pride or fear in learning new things. Share what you do, what you think, and what you’re planning so people can share back their perspectives. Also, in a world of rapid learning, share your work sooner and rougher rather than later and more perfect. Fast is better than slow in this case. If looking at this from a corporate perspective on innovation there are many examples by now where companies have chosen to openly share what they work on with the public, including the data they have, asking the public for help. This approach called Open data is really helpful for rapid learning and has been used by among others mining companies to share geological data so people, teams and companies all over the world can help in exploring missed opportunities in mining. What would happen if you were to share your programmatic data and process with all agencies in the world, asking for the best insights, solutions and steps you can take? 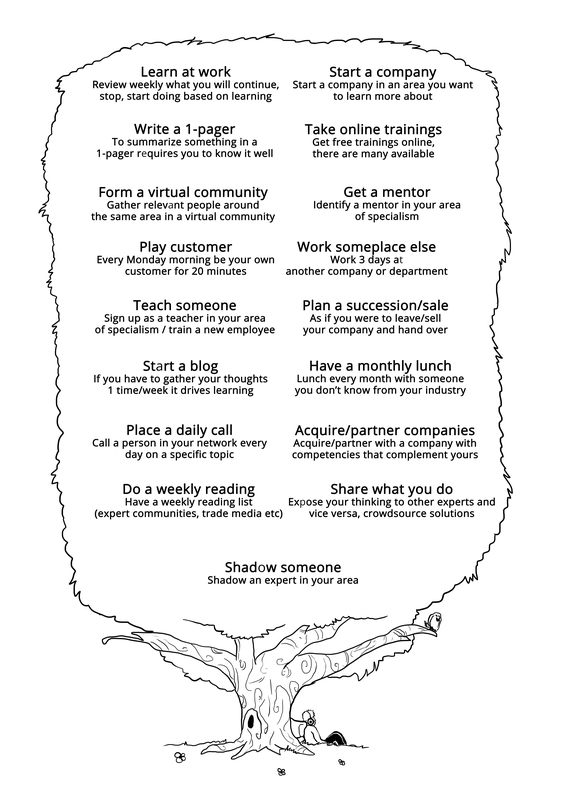 Shadow someone – A person on my team wanted to expand her understanding of the creative process at creative agencies. She ended up shadowing an Executive Creative Director for three days, and her feedback was that it was the most rewarding learning experience she ever had. Just ensure you ask before starting to shadow someone, it gets so creepy otherwise. Every week, share a bit of knowledge about areas that are important to your organization with your team to make them curious to find out even more.